The International League Governors' Cup Finals are now a virtual best-of-three, as Durham struck back Wednesday night with a 5-2 win over Scranton/Wilkes-Barre to tie the best-of-five series at 1-1. Durham took as quick a 2-0 lead as a team can, as SWB starter Nestor Cortes walked leadoff hitter Kean Wong before serving up a two-run homer to former Yankee Rob Refsnyder. SWB had a chance to come back immediately, putting two on with two out in the bottom of the inning thanks to a Gio Urshela double and Ryan McBroom walk, but Austin Pruitt got Mike Ford to fly out to end the inning. Cortes was dominant the rest of the way, retiring the next six in a row and allowing only three more baserunners over six innings, but Pruitt matched those zeroes, and the Bulls would strike again once they got to the bullpen. Come the seventh, Durham made it 3-0 against Brady Lail when Jason Coats tripled with two outs and Jake Cronenworth drove him in with a single. In the ninth, Cale Coshow had the same greeting as Cortes, as he walked leadoff hitter Brandon Snyder ahead of Nathaniel Lowe's two-run homer. SWB broke up the shutout in the bottom of the ninth, as Urshela hit his second double of the night ahead of Ford's two-out, two-run homer, but Durham's Colin Poche finished the three-inning save by striking out Zack Zehner to end the game. On the mound, Cortes took the loss and was charged with two runs on two hits, with three walks and six strikeouts. Lail went two, allowing a run on three hits and striking out four, and Coshow was charged with two runs on a hit and a walk in the ninth. He also recorded one strikeout to give SWB pitchers 11 total on the night. 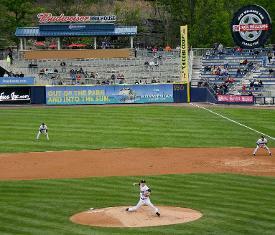 At the plate, Ford (1-for-4) and Urshela (2-for-4, 2 2B) had three of the RailRiders' five hits. Mark Payton and Wilkin Castillo had the other two hits - Payton's a one-out single in the third, Castillo's a two-out double in the fifth - and McBroom drew the only walk. The series would normally now shift to Durham for the remainder, but due to the pending effects of Hurricane Florence, the IL has decided to play the entire series at PNC Field. Durham will be the "home" team in Games 3, 4, and 5 (if necessary), and Game 3 will be Thursday night at 6:35 p.m., with SWB sending righty Mike King to the mound against Durham right-hander Chih-Wei Hu.